This resort features 3 buildings inside the complex called Jupiter, Saturno and Marte. The complex is a season resort hotel. Perfect for families with children. Customers at Club Mac will join waterpark situated across the road. Among the facilities you will find 9 swimming pools, 2 natural lakes, 3 spacious halls. Relax area, children village with children club, swimming pool and children park. Circus stage, a spectacular stage where professional performances are shown. 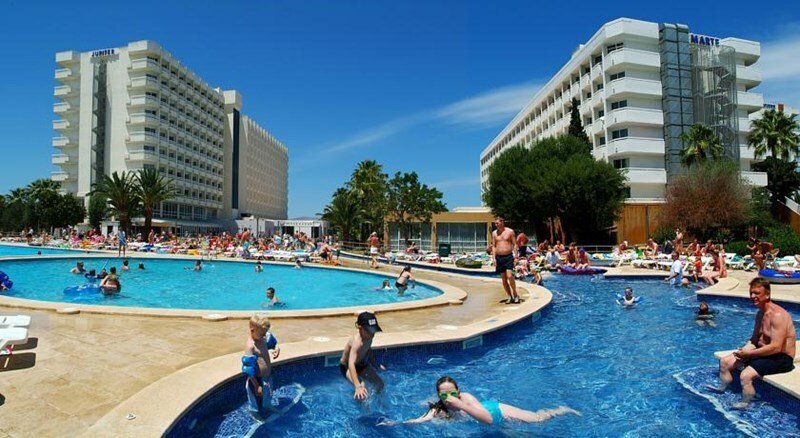 The hotel is located in Port d'Alcudia, the northern part of Mallorca. Only 1 km from Alcudia port and 800 m from its beaches. The hotel offers a free shuttle bus service to the beach every 30 minutes and free Shuttle bus to Port of Alcudia ( only high season). All rooms at Club Mac are designed and equipped to provide maximum comfort and to satisfy every need. Double standard rooms feature two double beds.